Soft antiqued brass knobs and bar handle are paired with a warm, cinnamon brown finish on this two-drawer night stand to create a delicate, timeless look for your master bedroom. The night stand possesses tapered feet and soft, inviting edges and clean lines. The two-drawers offer quality space for organizing clothing and other personal items. The addition of this two-drawer night stand will spruce up your master bedroom with classic subtlety. 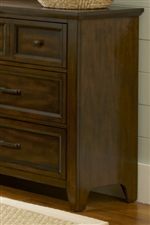 The Laurel Creek 2-Drawer Night Stand by Liberty Furniture at Novello Home Furnishings in the Berlin, Barre, Montpelier, VT area. Product availability may vary. Contact us for the most current availability on this product. Designed with exceptional beauty, each piece is quality crafted with a subtle, sleek look. Classic forms adapt as your needs change. With clean, modern lines, this selection is characterized by its simplicity, balance and purity of form in a casual style. Observe the subtle cut molding, beautifully framed drawers with French and English dovetail construction, rich cinnamon brown finish, complementary antique brass knob and bar hardware, and tapered legs and feet. Embellished with masterful notes, informed by timeless beauty, this collection comprises the finest materials, the cleanest lines, and a design that endures. The Laurel Creek collection is a great option if you are looking for furniture in the Berlin, Barre, Montpelier, VT area. Browse other items in the Laurel Creek collection from Novello Home Furnishings in the Berlin, Barre, Montpelier, VT area.